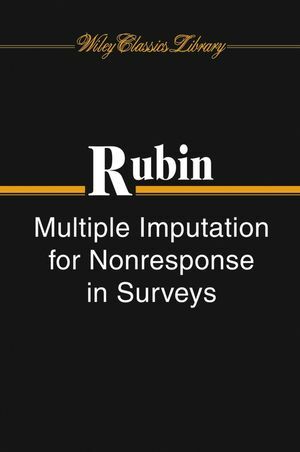 Demonstrates how nonresponse in sample surveys and censuses can be handled by replacing each missing value with two or more multiple imputations. Clearly illustrates the advantages of modern computing to such handle surveys, and demonstrates the benefit of this statistical technique for researchers who must analyze them. Also presents the background for Bayesian and frequentist theory. After establishing that only standard complete-data methods are needed to analyze a multiply-imputed set, the text evaluates procedures in general circumstances, outlining specific procedures for creating imputations in both the ignorable and nonignorable cases. Examples and exercises reinforce ideas, and the interplay of Bayesian and frequentist ideas presents a unified picture of modern statistics. Donald B. Rubin , PhD, is a John L. Loeb Professor of Statistics at Harvard University in Cambridge, MA. He was named 2000-2001 Statistician of the Year by the Chicago Chapter of ASA. His research interests include causal inference in experiments and observational studies, developing and applying statistical models to data in a variety of scientific disciplines, and the application of Bayesian and empirical Bayesian techniques. 1.2 Examples of Surveys with Nonresponse. 1.6 Numerical Example Using Multiple Imputation. 1.7 Guidance for the Reader. 2.2 Variables in the Finite Population. 2.3 Probability Distributions and Related Calculations. 2.4 Probability Specifications for Indicator Variables. 2.5 Probability Specifications for (X,Y). 2.6 Bayesian Inference for a Population Quality. 2.8 Bayesian Procedures for Constructing Interval Estimates, Including Significance Levels and Point Estimates. 2.9 Evaluating the Performance of Procedures. 2.10 Similarity of Bayesian and Randomization-Based Inferences in Many Practical Cases. 3.1 Introduction and Summary of Repeated-Imputation Inferences. 3.2 Key Results for Analysis When the Multiple Imputations are Repeated Draws from the Posterior Distribution of the Missing Values. 3.3 Inference for Scalar Estimands from a Modest Number of Repeated Completed-Data Means and Variances. 3.4 Significance Levels for Multicomponent Estimands from a Modest Number of Repeated Completed-Data Means and Variance-Covariance Matrices. 3.5 Significance Levels from Repeated Completed-Data Significance Levels. 3.6 Relating the Completed-Data and Completed-Data Posterior Distributions When the Sampling Mechanism is Ignorable. 4.2 General Conditions for the Randomization-Validity of Infinite-m Repeated-Imputation Inferences. 4.3Examples of Proper and Improper Imputation Methods in a Simple Case with Ignorable Nonresponse. 4.4 Further Discussion of Proper Imputation Methods. 4.5 The Asymptotic Distibution of (&Qmacr;m,&Umacr;m,Bm) for Proper Imputation Methods. 4.6 Evaluations of Finite-m Inferences with Scalar Estimands. 4.7 Evaluation of Significance Levels from the Moment-Based Statistics Dm and &Dtilde;m with Multicomponent Estimands. 4.8 Evaluation of Significance Levels Based on Repeated Significance Levels. 5. Procedures with Ignorable Nonresponse. 5.2 Creating Imputed Values under an Explicit Model. 5.3 Some Explicit Imputation Models with Univariate YI and Covariates. 5.4 Monotone Patterns of Missingness in Multivariate YI. 5.5 Missing Social Security Benefits in the Current Population Survey. 6. Procedures with Nonignorable Nonresponse. 6.2 Nonignorable Nonresponse with Univariate YI and No XI. 6.3 Formal Tasks with Nonignorable Nonresponse. 6.4 Illustrating Mixture Modeling Using Educational Testing Service Data. 6.5 Illustrating Selection Modeling Using CPS Data. 6.6 Extensions to Surveys with Follow-Ups. 6.7 Follow-Up Response in a Survey of Drinking Behavior Among Men of Retirement Age. Appendix I. Report Written for the Social Security Administration in 1977. Appendix II. Report Written for the Census Bureau in 1983.